Given the importance of working with platforms and intermediaries to tech and game companies, managing the relationships with the platform becomes crucial to your success. A Harvard Business Review article earlier this year, “Mastering the Intermediaries” by Benjamin Edelman, lays out a strategic framework for optimizing these relationships. Regardless of your business, if you are not a platform you probably rely on one or another type of intermediary for your success. Airlines and hotels are at the mercy of Kayak, Orbitz, Priceline and other platforms. Game companies rely on Facebook, Google and Apple for their access to customers. Small restaurants use Seamless or Foodler to reach hungry customers. Manufacturers must sell through Amazon to gain access to a large market. Moreover, almost every retailer looks to Google to refer customers. These intermediaries provide valuable benefits (hence why everyone works with them) but they can also capture a disproportionate share of the value a company creates. These costs, also, do not dissipate through competition as most markets usually only have one or two significant platforms (mobile phones, anyone). Thus, companies feel they have no choice but to accept the fees and rules the platforms institute. Edelman’s article, however, shows strategies for recapturing some of the value companies are creating and protecting yourself from abuse by the platform. The power platforms and intermediaries wield is excluding a company from being listed or offered, however, the business also has power in that the platform needs to offer its customers a comprehensive service. Edelman described the case of Kayak, where American Airlines was able to negotiate favorable terms because Kayak would not have been an effective travel service if it did not include American Airlines flights. Real estate is another example. Realtors actually hold the upper hand with Zillow, because if the site does not have complete listings it has little value to users. Thus, realtors get to make listings for free and include significant marketing material. The public wants a platform to present options fairly and the platform does not want to be accused (and potentially drive users away) of discrimination. For example, after Google’s failed efforts to acquire Yelp, Yelp listings became much less visible in Google search results. After significant publicity and complaints from the public, Google reinstated Yelp listings to their previous position. Getting your customers on board is essential when making any charges of discrimination. You need to energize your customers if they are not already complaining to help pressure the platform to treat you fairly. Keep in mind that platforms often push back on the concept that they should treat all suppliers equally. They will also often get away with discrimination – especially subtle that the customer may not notice but could have a major impact on your business – as long as users to do not care or notice. Thus, it is important to get your customers behind you when claiming discrimination from a platform. When multiple platforms compete, sellers typically find it easier to get improved terms. Competition among platforms can help enhance suppliers’ position relative to them. Also, a company could forego working with a large platform if there are multiple smaller ones they can work with that would replace the volume lost. Edelman points out a platform’s scale and reach is often less stable than it seems, and with the right partners a savvy supplier can introduce significant competition. For example, Regal Entertainment (a movie theater chain) could not work out an agreement they liked with online ticket seller, MovieTickets, which was dominating movie and phone ticketing services. Regal then formed Fandango with two other large suppliers and not only blocked MovieTickets but ended up creating a larger platform. Many consumers buy through a platform not because it is easy but because the seller offers no way to buy directly. If done properly, a direct channel can displace the platform provider for at least some of your customers and make it less likely to exploit its position. Although the platform often appears free to the customer, it adds substantial costs to the businesses that are often passed to the customer. Thus, the business can offer a discounted direct service that customers find beneficial yet are still more cost effective for the company. 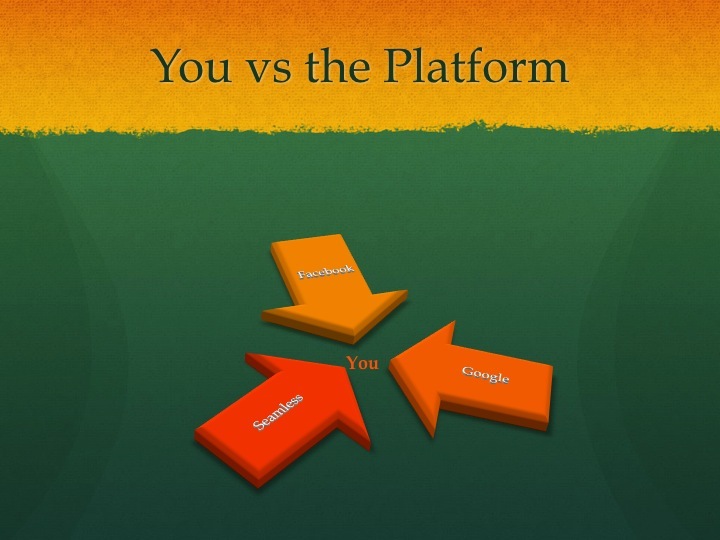 Platforms play a key role in the success for many businesses and often hold a very powerful position. It is important for companies to look for ways to better balance this relationship. A very powerful tool for companies is the platforms need to provide a complete offering, it may hurt them as much as you if you are not available. Call out—and more importantly have your customers call out—any discrimination you face from the platform.